It was also mentioned in an article posted at IGN.com when they ran their "Great Cartoon Archive" Articles, that features such editorials on MASK, Robotech, Silverhawks, Transformers, GI JOE and many others. * The Unofficial Voltron Force Homepage: of the dozens of Voltron fan sites we checked out for this article, this is the only one that consisted of more than a couple lines of text, a few blurry pictures, godawful screaming MIDI files, and barrage of Geocities banner ads. Nice gallery, episode title list, Japanese anime summaries, and more can be found here. In 1999. World Events Productions, through their VoltronForce.com website, had a contest for who could develop the Best Voltron Fan Web Site. 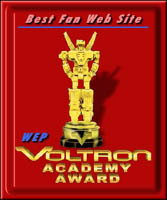 The Unofficial Voltron Force Homepage was nominated, and through public voting, this site was voted to be the "best". I would also like to take the time to recognize the other participants in this contest, as each were just as good, and if not some were better than my site (imo). Keep up the good work guys!